So Corporate Skull issue two starts in about two weeks time. Initially I intended to spend this time writing it, but as it happens I got a little over-keen towards the end of issue one and wrote issue two alongside it. I’ve finished inking a handful of pages too. But I’d like to take this short break to build up a bit of a backlog, I just need to find a day or two spare to work on it properly. This way, hopefully we’ll be able to do a few more twice-weekly updates, get this story thundering along. Issue one was very much an ‘origins’ story for Corporate Skull (it was rather unimaginatively called that until the last minute), establishing our hero, the characters around him and point us in the direction we want to go. Issue two is going to turn that on its head. In my mind Skull isn’t yet made as a character, who he is will be shaped and defined over the first four issues. And then beyond. The full story of Corporate Skull (however many issues it is) is about him becoming who he’s supposed to be (as the final page of issue one hints to), and clawing his way through events to get there. And those events will be pretty mental, the tube-train explosion is nothing in comparison. Issue two will start to show us the wider picture. Sorry, babbling. Also, excited. See you back here in two weeks! ps. 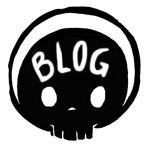 hey y’know i’ve started seeing Corporate Skull fanart floating around, if anyone wants to do any I would of course be humbled, maybe we could collect it together on the site. Send it in! Oh oh oh I can’t wait ! ! ! Bring it on, Mr Smart. I will be waiting feverishly. Or possibly just mildly sniffly, but certainly with some degree of sickness.